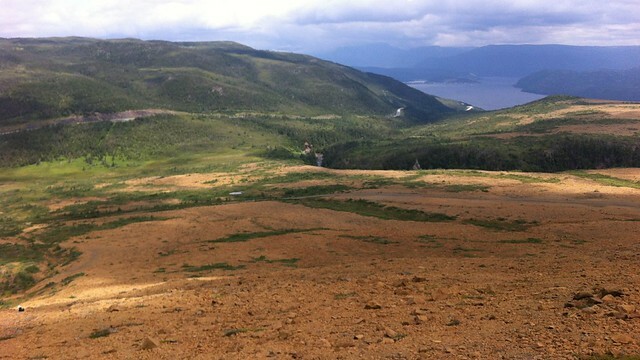 Gros Morne has three dominant features: Bonne Bay, Gros Morne mountain, and the Tablelands. 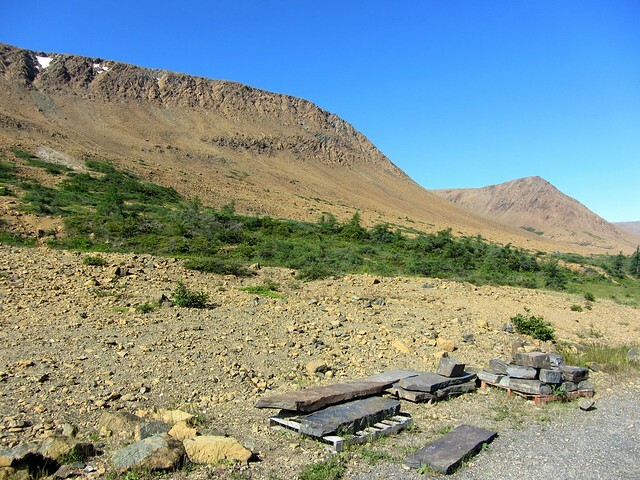 We had expected epic fjords and rocky forested mountains - but we hadn't expected the Tablelands. 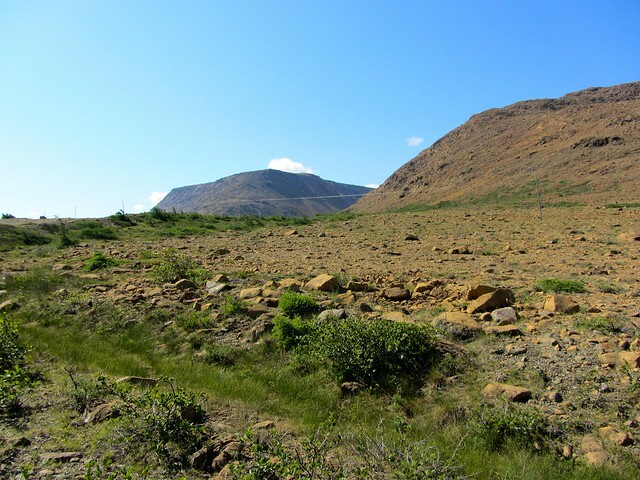 In the middle of green and damp Newfoundland, the Tablelands looked like a chunk of Arizona or perhaps even Mars. 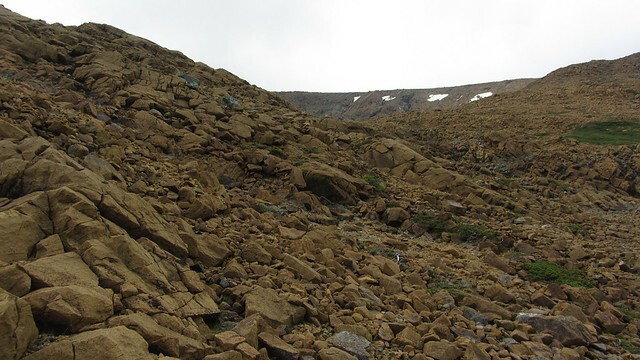 It turns out that this is because the Tablelands are a piece of the earth's mantle that was shoved up to the surface by plate tectonics. It's heavy in iron, so it's rust-red like the surface of Mars. 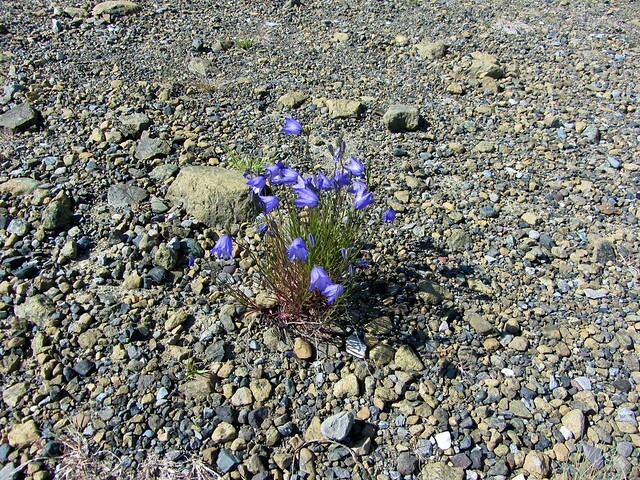 It's also low in nitrogen and other plant-friendly nutrients, so the plant life is very sparse, and mostly consists of tough lichens and carnivorous pitcher plants, scattered about with pretty purple flowers. 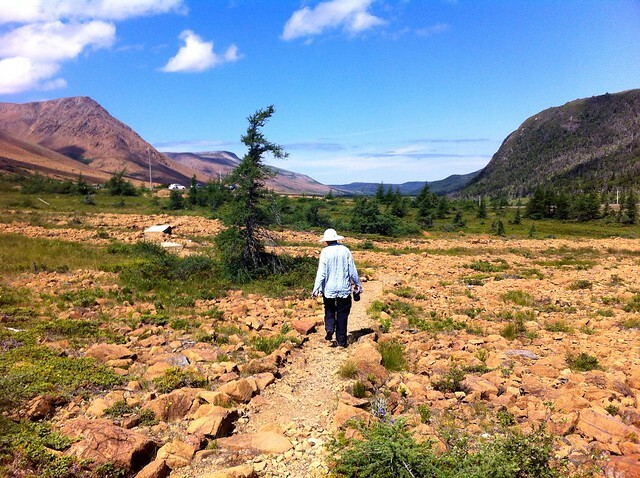 We explored the Tablelands twice: first was a short morning hike along the official marked and occasionally boardwalked trail that went along the base of a ridge and into a large valley. 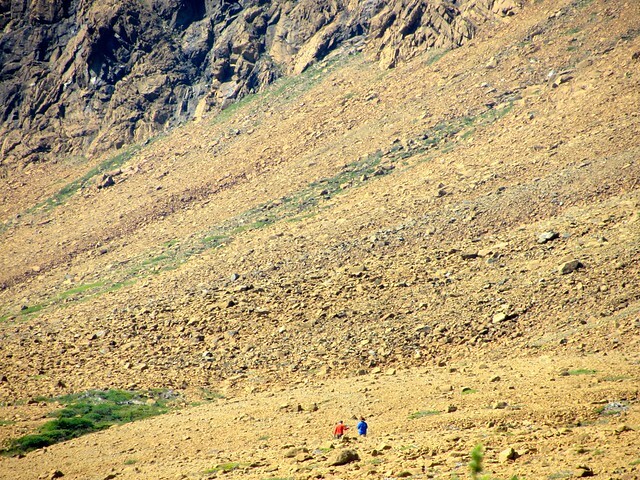 We met up with an Asian family we had passed on the trail back from Gros Morne mountain the previous day. 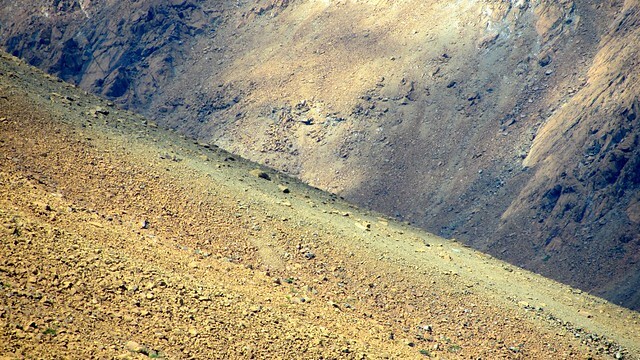 The mother chatted with us while her two sons hiked out over the rocks. 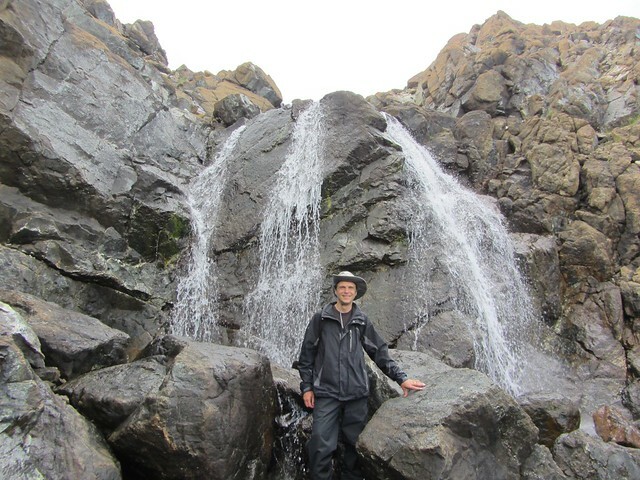 ... and then we hiked straight up a river gorge to a waterfall. So many other parks and trails have strict limits on where you're allowed to walk. 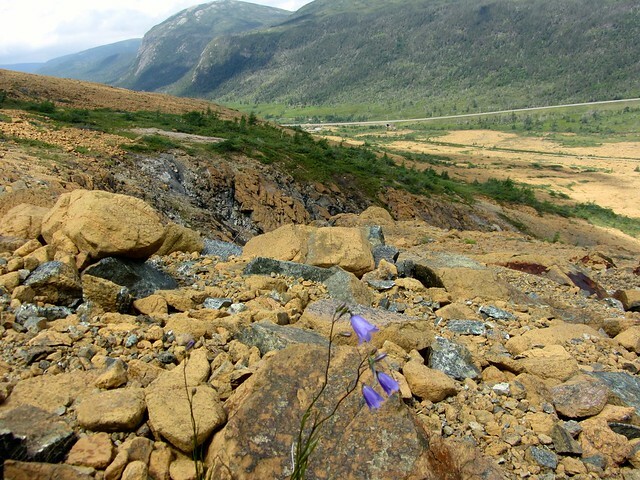 Gros Morne mountain, for example, is pretty strict about keeping people on the trail - not just to protect the fragile tundra ecosystem on the upper plateau, but also to keep you from falling off of a cliff in the fog. 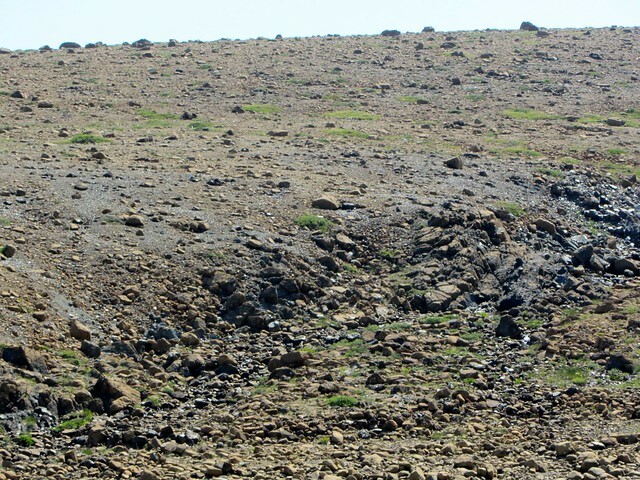 Parks and trails in the lawyer-ridden United States are often loaded with signs pointing out official paths and desperately declaiming any responsibility for the slightest step into the untamed wilderness. 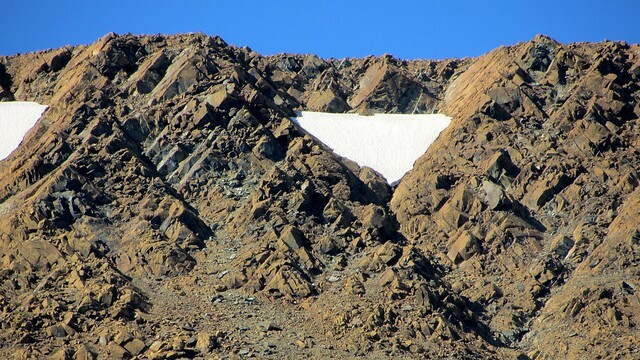 I had hoped to climb all the way up into the snow-capped crater bowl that we had seen on our first day in town - but we had a flight to catch later in the day and didn't want to get stuck too high up like a cat in a tree. I did manage to make it most of the way up, where I was able to catch some great panoramas of the tablelands and the nearby valley. 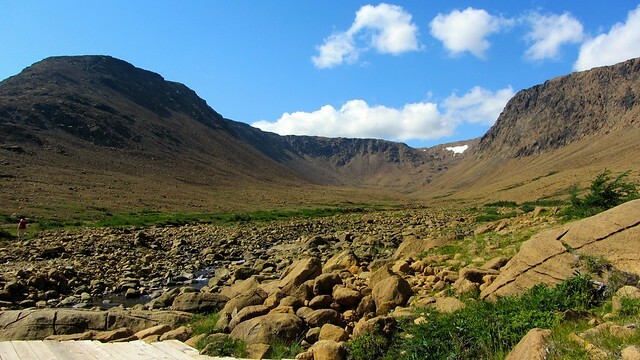 If you're in Eastern Canada and don't want to go all the way to New Mexico or Arizona or Jordan - or, for that matter, Mars - check out the Tablelands in the sunny Newfoundland summer. 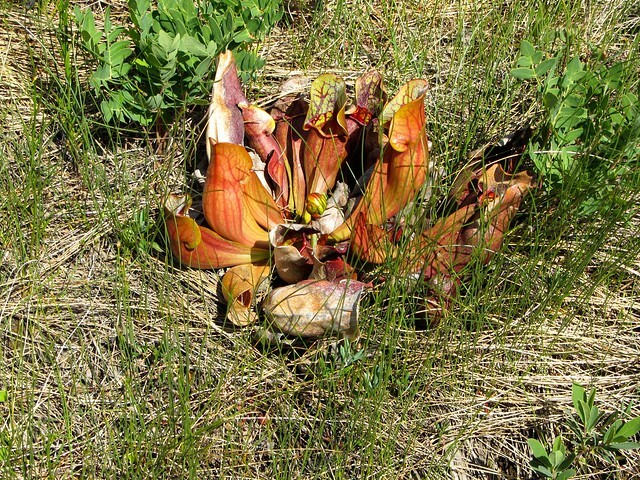 It feels remarkably similar - except you also get super-friendly Newfoundlander hospitality, beer made from 30,000-year-old iceberg ice, as well as carnivorous plants.